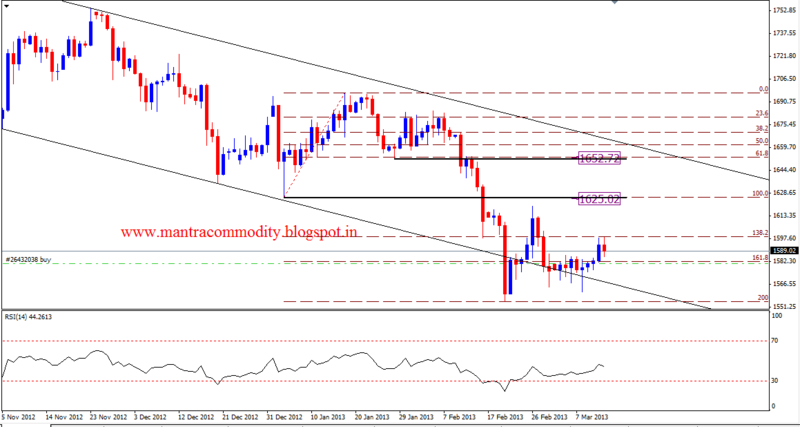 Now MCX Gold is trading around 29440 ($1587) & as we can see on charts , this area is not far away from last report levels but due to INR factor we witness a large sell off in mcx. Gold is not taking support from 200% feb correction level of last ascending wave as well as this area represent the parallel support from 6th & 7th month 2012 (not shown in chart). In the deep picture we observed gold made a support area around $1550 now , which looks very strong. Candlestick pattern is turning positive while indicators are neutral now. Based on above studies, we will prefer to buy gold & prefer to wait for possible targets around 29900 ($1625) & then 30370 ( $1652) area until unless gold is not providing any day close below 28800 ($1540) area.